Okay, I see a lot of people complaining about allies, multiple Detachments, and min-maxing - especially regarding minimal Imperial Guard Battalions to farm 5 Command Points for the lowest cost possible. I agree that min-maxing is an issue, and the system is indeed vulnerable to exploitation, but a lot of the proposed solutions seem hell-bent on penalizing people for taking multiple Detachments or allies. That will just throw people down into the other end of the spectrum and have everyone just take one detachment instead. So everyone will be squeezing everything into Brigade Detachments and people will just go from one end of the spectrum to the other, and take mono-armies. Frankly, as much as it is irritating to see that 180-point Guard Battalion sitting in one corner of your opponent's list, it's just as boring to see everyone bring a brigade or battalion of nothing but Space Marines, or Chaos Space Marines, or Guard. The fun in 8th Edition is the allies system, where you can have your Guard supporting a Space Marine assault, or hordes of Daemons following in your Chaos Space Marines' wake. It'll be a waste to throw all that away. No one will take any of the specialist Detachments. At least now we have people taking specialist Detachments alongside Battalion - that's the way it's meant to be played. An Imperial Guard Spearhead Detachment of an armored Leman Russ company supported by a battalion of Guardsmen? Oh, yes please. That's fluffy, fun and makes a lot of sense. A Battalion of Guardsmen, with supporting infantry, heavy weapons and auxiliaries hunkering down in the deployment zone while an Outrider Detachment of Space Marine bikers zoom forward to grab objectives (perform surgical strikes at high value targets)? Definitely. A battalion of Skitarii infantry escorting an Imperial Knight? Makes a lot of sense. Even more, if they're accompanied by a Vanguard Detachment of chanting Electro-priests. A Battalion of Thousand Sons (Rubric Marines) that march alongside a Spearhead Detachment of daemon engines like Forgefiends and Maulerfiends? Fluffy as hell. The issue here isn't with allies. It's with people min-maxing. Like, if someone just taking a minimum-sized Thousand Sons Battalion with nothing but Tzaangors and Cultists and no Rubric Marines, because it gives 5 Command Points, and they only need the Sorcerers for the psychic powers. Or an Outrider Detachment of Space Marine bikers that outnumber your measly 30 Guardsmen in the Battalion for some stupid reason (it's supposed to be the other way around). Or 3 gigantic Knights stomping around the field while 30 Guardsmen cower at the back instead of...you know, actually escorting the Knights. And where are the freaking Leman Russ tanks? Or 30 Cultists on the table, with the rest of the army being nothing but Daemon Princes, Daemon Primarches (Magnus and Mortarion). Uh...where are all the Chaos Space Marines? Oh, so the Cultists are there just for the Command Points? But...how the heck did they summon all those Daemons without any Traitor Astartes' assistance? One of the ways I proposed in an earlier post was to stipulate that each Detachment must be at least a percentage of your points. Of course it's impossible to make each Detachment exactly the same number of points as each other, and it would restrict list-building a lot. So let's give some leeway. For example, in a 1,000-point game where you're only allowed 2 Detachments, each Battalion Detachment must be at least 33% of your army. So you don't just grab a 180-point Guard Battalion for 5 Command Points and then stuff the rest of the points into say, 2 Knights or something. Of course, this is only for Battalion (and Brigade, if necessary), because specialist Detachments are meant to be elite, small, specialist Detachments. It makes no sense for 3 Assassins in a Vanguard Detachment to be 33% of a 1,000-point army, after all. And the Command Point you get for these specialist Detachments are too little anyway. So for 2,000-point games with a maximum of 3 Detachments, each Battalion Detachment must be at least 25% (or 500 points). So no more spamming 180-point Imperial Guard Battalions, or Cultists Battalions or whatever. Want those 5 Command Points? Invest a huge chunk of your army into that Battalion Detachment. Otherwise no go. Of course, specialist Detachments are excluded - bringing just 3 biker squads or 3 Assassins, or maybe even 3 Veteran squads, or 3 psykers, won't be enough tor a specialist Detachment (especially Vanguard Detachments). Otherwise there's no point in me taking 3 Armored Sentinels in an Outrider Detachment to represent a scouting Imperial Guard platoon because I might as well roll it into a larger Battalion (that might be the point, though). Or 3 Hellhounds. Another solution, because people are so hell-bent on punishing players for taking allies (imposing penalties) and complaining that people min-max by selecting the best units from 3 codexes or whatever, is to give Regimental Benefits. No, not just the Regimental Doctrine that applies to everyone in your Detachment. I'm talking about something bigger. 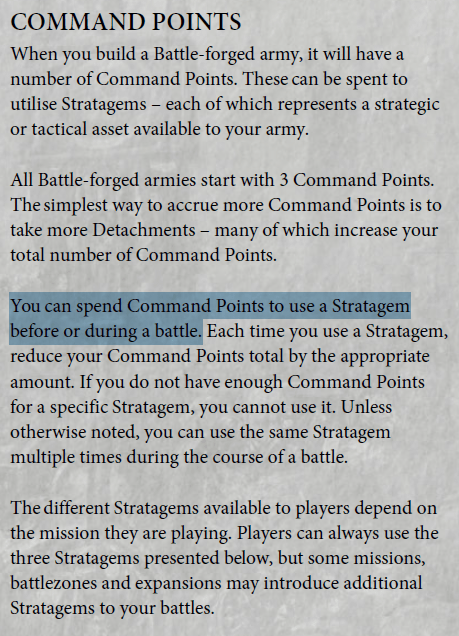 All Battle-forged armies start with 3 Command Points. 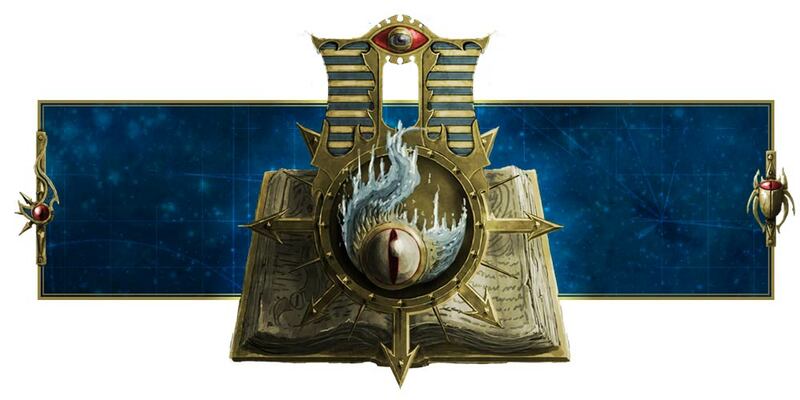 Furthermore, if all Detachments in your army share a <REGIMENT> or <HOUSEHOLD> or <CHAPTER> or <LEGION> or <HIVE FLEET> or <BROOD BROTHERS> or <CRAFTWORLD> or <MASQUE> or <CHAOS DAEMON> or <DYNASTY> or <SEPT> or <ORDER> or <FORGE WORLD> or <WARBAND> or <WHATEVER> KEYWORD, you get an additional 5 Command Points. If 5 is too much, then 3. I don't know. Or 4. Thing is, it'll have to offset the advantage you get from just taking any random Imperial Guard Battalion for 5 Command Points in an Adeptus Custodes or Imperial Knights or whatever list for less than 200 points. It gives you an incentive to build a mono regiment army. This works especially well for Imperial Knights, who are lacking so much in the Command Points Detachment. Instead of spending those 180 points on a freaking minimum-sized Imperial Guard Battalion for 5 Command Points, you can spend those on an Armiger Helverin or Armiger Warglaive to get the same HOUSEHOLD benefit. This rewards people for deciding to be loyal and stick to their main Faction rather than taking random allies just for the Command Points or whatever. Furthermore, it also allows elite armies who are lacking in Command Points, such as Imperial Knights or Adeptus Custodes, to actually have a fair chance of using that vast array of Stratagems in their codexes without being forced to rely on taking minimum-sized Imperial Guard Battalions for farming Command Points. As a side note, Drukhari are special, but that can be easily adjusted to rewarding players for receiving +9 Command Points for taking 3 or more Drukhari Patrol Detachments (as part of their Raiding Force rule) or +18 for taking 6 or more Drukhari Patrol Detachments that do not share the Cabal or whatever keyword that applies to the other forces. This doesn't punish people for taking allies, however. But it does prevent exploitation by ensuring that if you want to take an allied Detachment, you've to actually invest more in them - such as buying a Battalion to get the same number of Command Points as someone playing a mono-faction list. Of course this also forces people to stop min-maxing - you want those 5 Command Points? No mixing and matching Regiments - instead of bringing a Cadian Spearhead Detachment of heavy weapon squads with a Catachan Battalion of artillery or Leman Russ tanks and Strength 4 Infantry, you pick one Regiment - otherwise, you lose out on those 5 Command Points. In such a scenario, you can see how it works. That 180 points you were going to spend on Imperial Gaurdsmen for your Space Marine army to get 5 Command Points? Might as well invest those points in a Predator or a couple of tactical squads, or maybe a Terminator squad instead, and you'll get the same number of Command Points regardless. Honestly, you can still take a 180-point Guardsmen Battalion for 5 Command Points if you really, really want to, but it makes no difference than if you invested those points on units from the same Chapter. But you have the option to do either - perhaps you want to stage a last-stand scenario where the last, remaining survivors of a near-annihilated Imperial Guard regiment are making their last stand when the Space Marines swoop in to save them. You also can just go with a fluffy, all Ultramarines list. You don't get penalized for doing either option. This, which encourages diversity, is what I believe is the best solution rather than discouraging one or the other. But if you're still worried about exploitation (people trying to squeeze in three Battalions to get 15 Command Points, rather than the 10 they get with a single Battalion of the same Chapter - but honestly, why aren't you using the other Detachments like Spearhead or Vanguard or maybe just grab a 2nd Battalion of the same Regiment or Chapter for the same 15 with less taxes, or 12 with 2 specialist Detachments? You're not that desperate for those 3 extra Command Points, are you? Especially when you already have 12 Command Points - and that's even before you include the 3 from your army being Battle-forged, so a total of 15 - are you that desperate for 18 Command Points? Why not just take a mono-faction Brigade, which will net you a total of 20 Command Points? 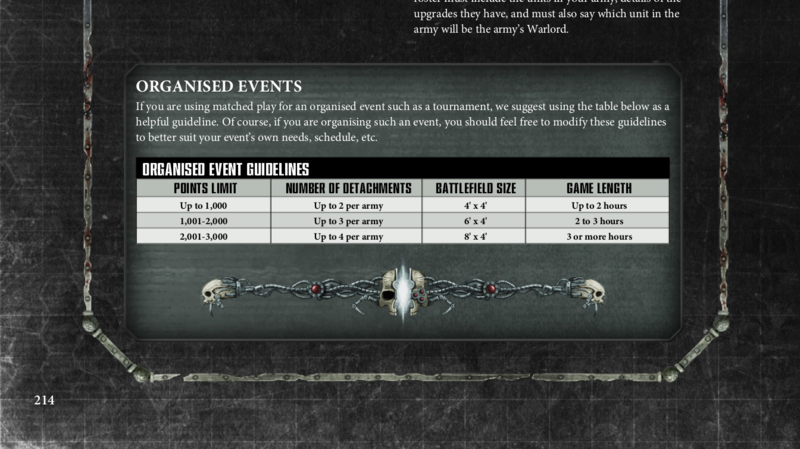 ), then there's also the option to combine this option with the suggestion above: not only do you get 5 Command Points for playing the same REGIMENT or CHAPTER or HOUSEHOLD or FORGE WORLD, any Battalion Detachment you include in your army must be a minimum of x% of your entire army (25% for 2,000 points sounds fair enough). Of course, this scenario is not perfect, and I'm open to suggestions. I really, really don't want to penalize people for taking multiple detachments or allies, and I think forcing people to spend Command Points to "purchase" extra Detachments will be a bad idea. Nobody will want to take a new Detachment, and everyone will just cram everything into a single Detachment, whether it's a Battalion or a Brigade, because there really is no benefit to taking an Outrider Detachment or Vanguard or Spearhead Detachment (since your Battalion allows you to take up to 3 per slot). It will render these Detachments completely obsolete and redundant. So instead of taking a Vanguard Detachment, I'll just put all the Elites in my Battalion's available slots, save on the HQ tax, and even save on Command Points too! Uh...how is that "balanced" or fair? That doesn't solve the problem of min-maxing - people will just min-max in the other direction. Well, let me know what you guys think, and I'll see you guys next time!